How to encourage your children to cook! Check out this fantastic article from The Telegraph on how to encourage your little ones to cook. We all know the story. Cooking with children is good news. If you can teach them to grill a chop, make a tomato sauce and knock up a simple soup from a few oddments of veg, you are setting them up for a lifetime of healthy eating. And with half term on the horizon, what better time to head for the kitchen? So far, so good. But the reality of getting children involved in meal preparation is rather more fraught than you might suppose. You can spend many hours trying to emulate the glossy magazine photographs of immaculate children rolling dough with their smiling mother – only to end up foul-tempered and encrusted with gunk. Never mind the safety anxieties, tinies have scant regard for kitchen hygiene, with fingers darting from nose to mixing bowl faster than you can say, “Snot there!” And by the time they are teenagers, the burden of homework and hormones means persuading them to spend time learning how to roast a chicken – well, it’s enough to make even parents roll their eyes and mutter “whatever”. The sweet spot, according to Jenny Chandler, whose new book Cool Kids Cook has just been published, is in between – from seven to 12, to be precise. “At this age they can really achieve something,” she says. Get children involved at the planning and shopping stage and allow them to make some choices. Choose moments when there is plenty of time to cook, rather than when everyone is stressed and desperate to be fed. Encourage kids to hang out in the kitchen as you cook and hand them jobs like shaping falafel, mashing avocados or podding peas. Get them to develop one signature dish and practise it until they can cook really confidently. 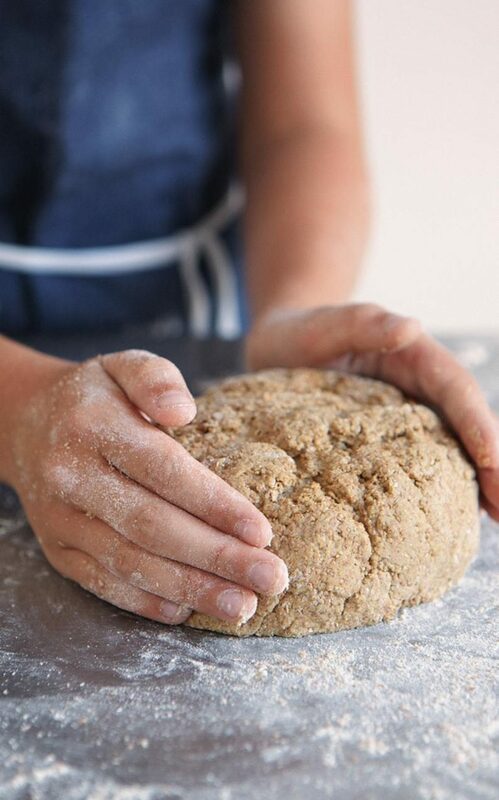 Once a child understands how a recipe works, encourage him or her to experiment with new flavours. 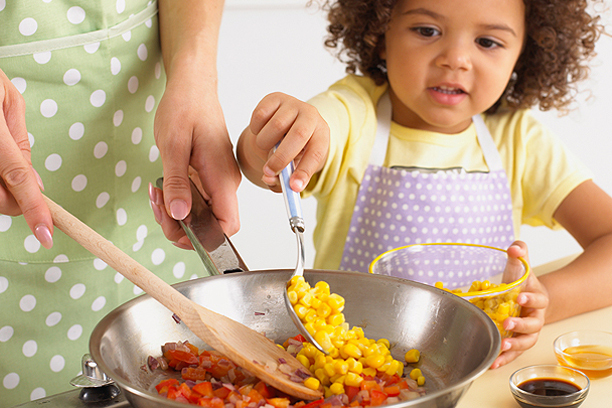 Let kids use proper kitchen tools as soon as they are able, so cooking feels grown-up and cool. By seven, children can use sharp knives safely and efficiently if shown how. Set them a challenge of cooking an entire meal and invite friends or family around to enjoy the results. They’ll have a huge sense of achievement. Be on hand to keep an eye on tricky tasks like grilling, but try not to interfere too much. Make holidays and outings a culinary adventure, gathering wild garlic or buying mussels in a local market. They’ll be more engaged and excited by the food. Start with simple, tactile stuff, such as guacamole, says Thomson. “Little kids love the gross stuff. Ivy likes to squidge the marinade into a chicken.” They’ll progress quickly. “Grace has her own knife, a children’s one, and I’m happy about her chopping with that.” (Try Opinel Le Petit Chef, £27.95, or – even safer, though less useful – theKiddi Kutter, £9.99). As for Dot, “she’s good at licking the spoon,” says Thomson, laughing. Chandler, an experienced teacher, with regular classes at Bertinet Kitchen in Bath, as well as London’s Borough Market and her alma mater Leith’s School of Food and Wine, believes it’s all about confidence. With children even more than adults, she says, the key is to teach useful techniques. With this in mind, her book focuses on master recipes such as pancakes or fish parcels, then incorporates twists so that kids can make many other dishes. So a simple meatball can be adapted to make Vietnamese lettuce wraps with lemongrass-scented meatballs, or a Moroccan lamb version with couscous and tomato sauce – skills most adults would be delighted to master, too.